TimeMe's online Timer and Stopwatch products are great as classroom timers, test timers, sports timers, debate timers, meeting timers, and presentation timers. 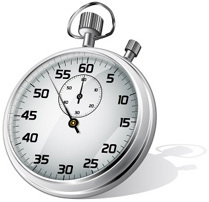 Our Timers include stopwatch timers, split lap timers, alarm clocks, time-clock timers, and presentation timers. Some are free, some are not. We have both web and download timers. We've been developing online Timers since 2005 and strive to make our timers robust, easy to use and accurate. Online Timer Stopwatch counts up or down, using various time formats, with or without alarms, in a loop or not, and in various display colors, sizes and fonts. Online Split Lap Timer records time splits (intervals) using mouse or keyboard controls, with or without sound, and in different display colors, sizes and fonts, etc. Online Alarm Clock with multiple alarm times, alarm sounds, fonts, sizes and colors. At each time point, you can select an alarm to sound, and/or change the color of the time display. Online Chess Timer gives chess players complete chess match timing control using time limits, time delays, time increments, odds, move counts, totals, averages and penalties, along with complete move time history and summary. Same as our advanced online Split Lap Timer above, except runs without accessing the web, and with no ads. Works on PCs and Macs. Downloads as a zip file. Same as our advanced online Chess Timer above, except runs without accessing the web, and with no ads. Works on PCs and Macs. Downloads as a zip file. Easy to use and can be stretched to any size. Robust, fast, and intuitive. Calculator is great in the classroom, office, lab, or at home. 12-digit display, left to right math calculations, large display, examples, keyboard shortcuts, and you can save your settings. Best online calculator in our opinion, and ECO Friendly too. Time saving way to Bookmark, Browse and Search, the web. Our time tested online service, lets you combine your favorites / bookmarks from multiple computers and from multiple browsers. There's a learning curve, but it is invaluable, once it starts helping you all day, every day. Crucial to IT professionals worldwide, for 10+ years now! In a world of fleeting communications, an endearing Telegram from you will be long remembered. Send one to break the ice, announce an event, or just to say thank you. 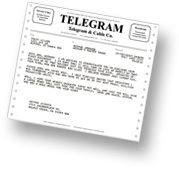 A novel Telegram, on paper, arriving by mail, has a lasting impact on the young and old alike.